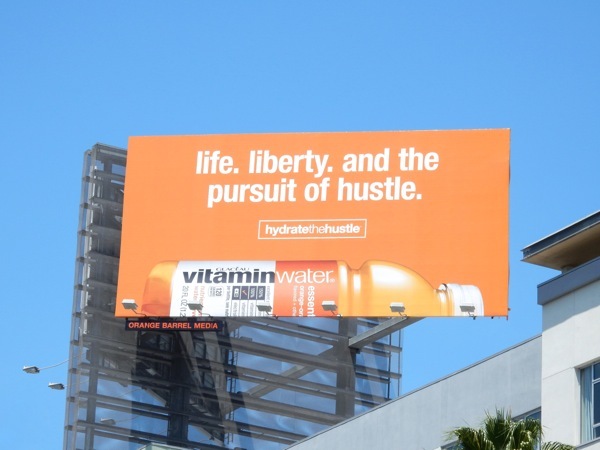 With all the crippling traffic jams, mega-construction projects and irritating honking horns, this vibrant new 'Hydrate the Hustle' outdoor ad campaign from Vitamin Water is just the tonic to energize the streets, skies and freeways of L.A. 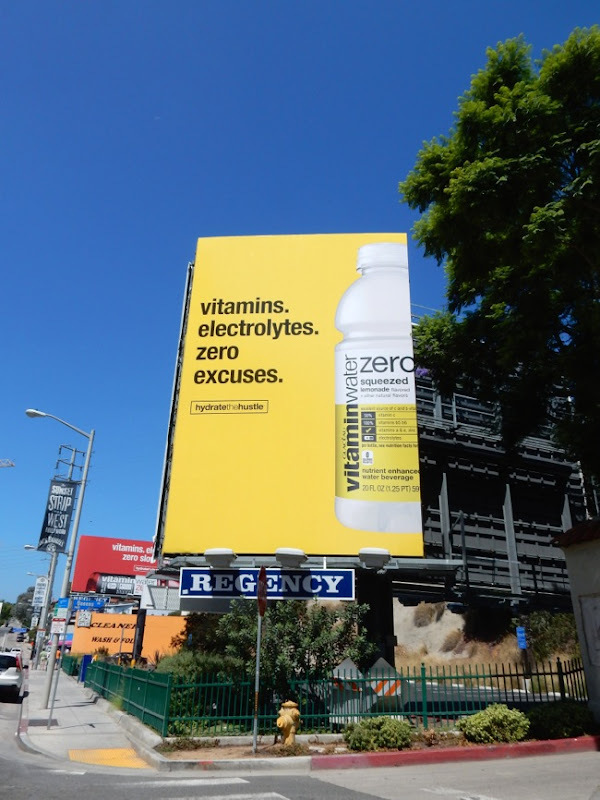 If you look at these previous Vitamin Water ad campaigns, these latest billboards evoke the simple, colourful designs from 2010, where the product shot is clearly the hero. 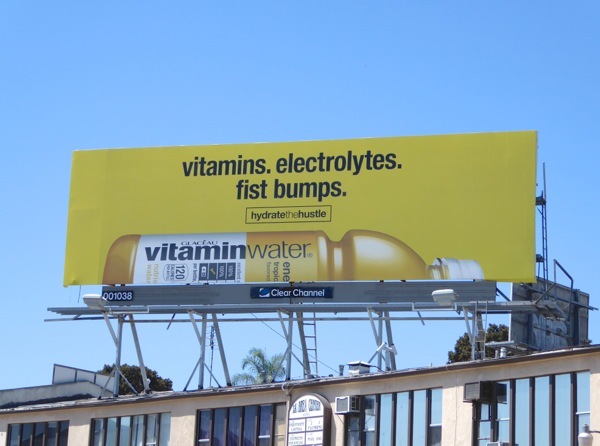 And while Daily Billboard likes the humour in these bright new ad creatives, the You're Up Vitamin Water campaign from 2012 featuring people in motion had a real raw energy about them by comparison. 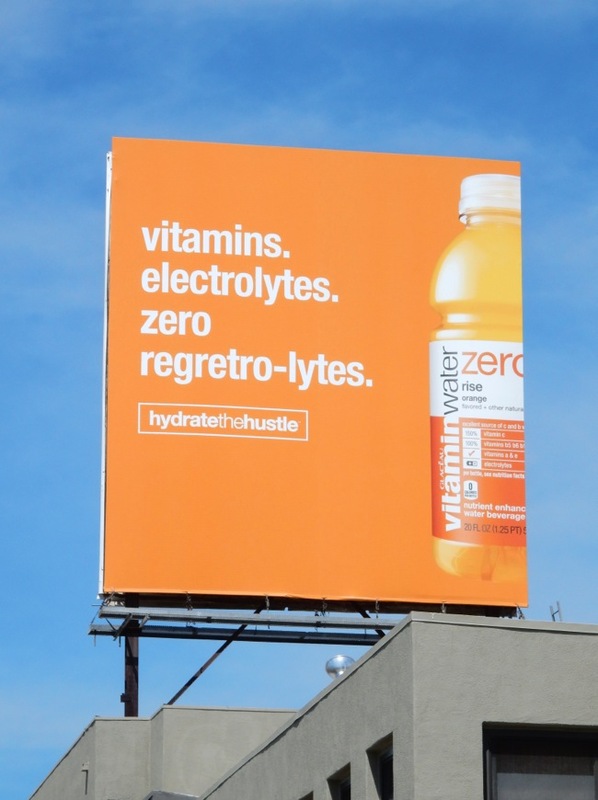 These Hydrate the Hustle billboards were first spied above Beverly Boulevard on August 5, then photographed through to August 8, 2015 along the Sunset Strip in West Hollywood and at Sunset & Vine in Hollywood. 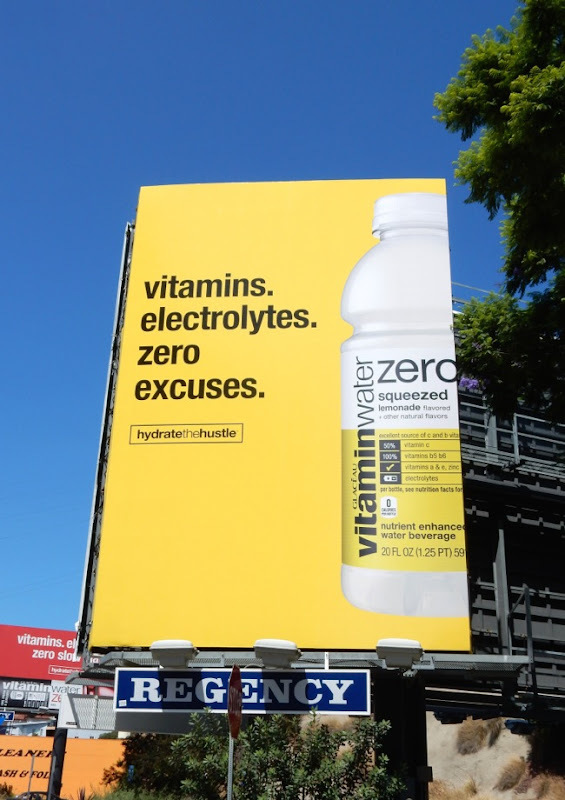 It's a no-brainer that in a city obsessed with physical perfection and sporty activities that the enhanced-water brand owned by The Coca-Cola Company wouldn't spend big advertising its bottled water drinks, where consumers are ready to lap them up (or should that be glug them down) in the perceived pursuit of health. 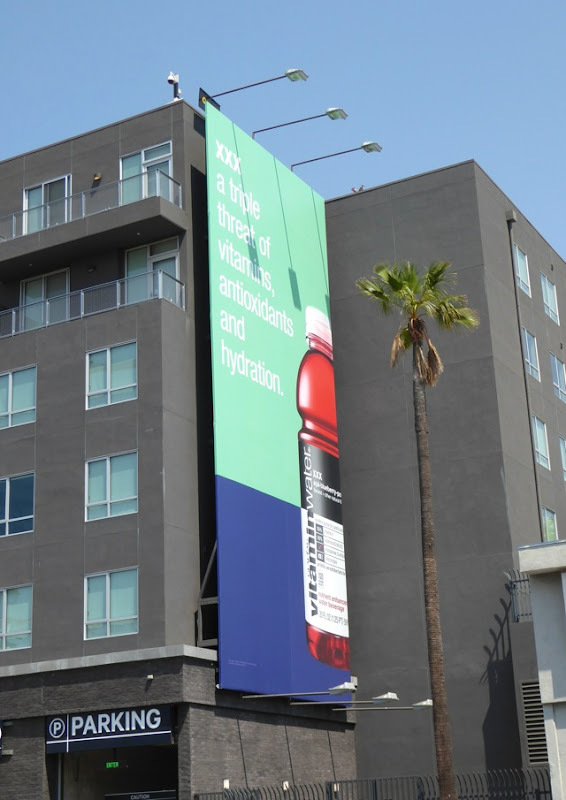 For an example of a premium water brand using celebrity endorsement, be sure to also check out these Jennifer Aniston Smart Water billboards, also owned by the company. 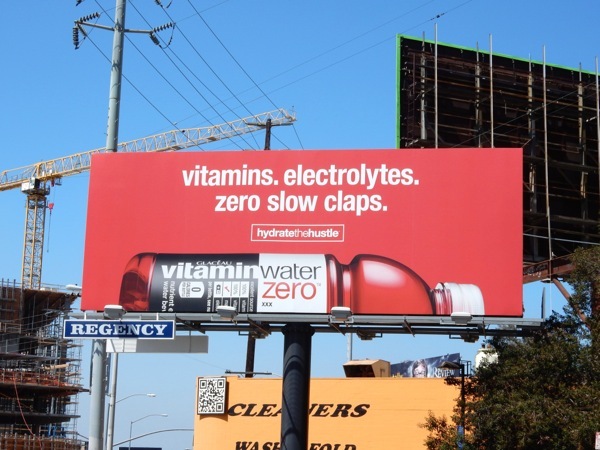 Plus for a different approach to advertising enhanced-water, you can also take a look at these Activate Water billboards. 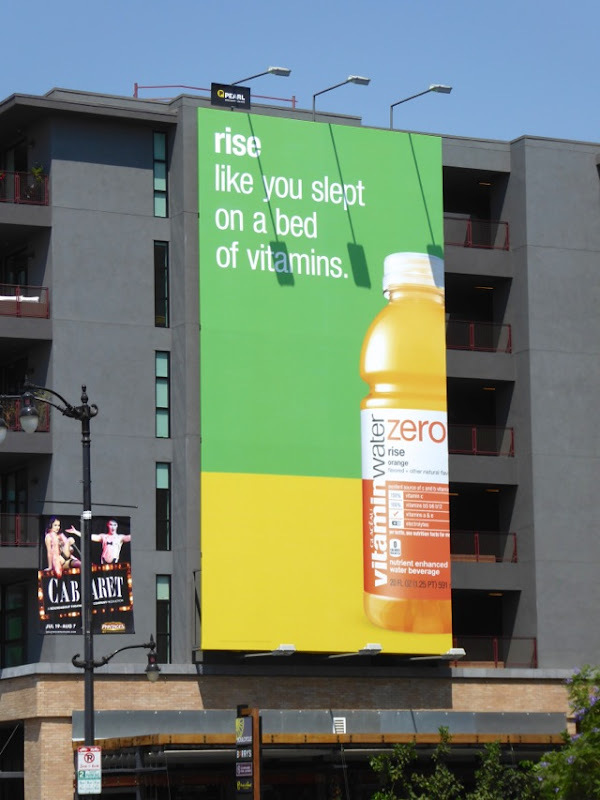 Have these colourful examples helped quench your creative thirst at the start of another working week? 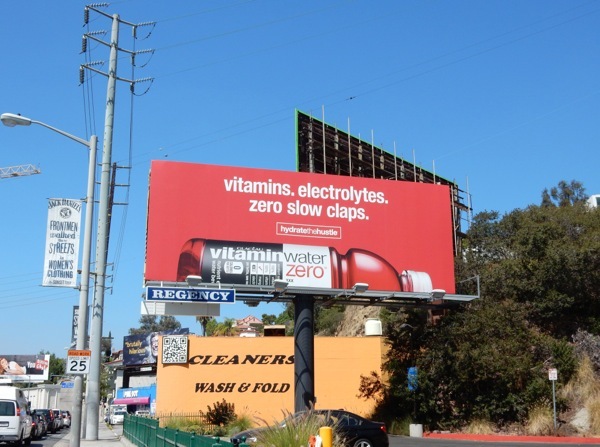 California may be experiencing severe drought conditions at the moment, but Daily Billboard is sure there'll be no shortage of Vitamin Water billboards filling the skies in the coming weeks, just sit back and drink them in. 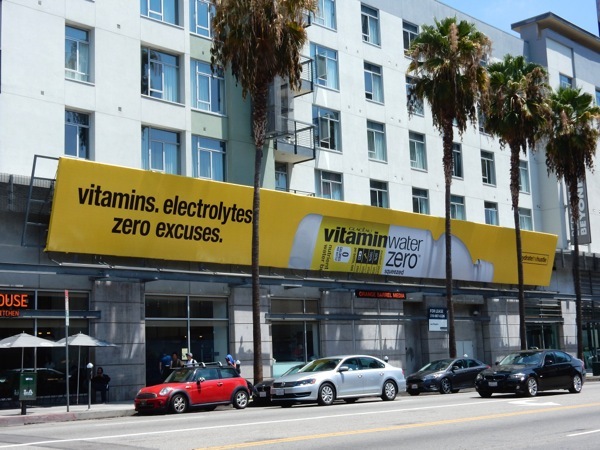 UPDATED: Here are two more examples of the new Vitamin Water outdoor campaign from around the streets of Los Angeles. 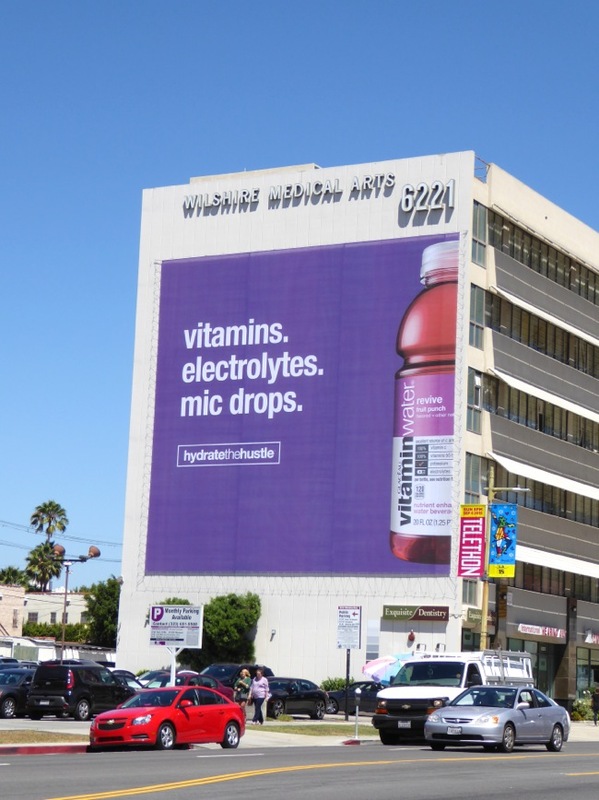 This super-sized purple 'mic drops' billboard was snapped along Wilshire Boulevard, whilst the yellow 'fist bumps' giant creative was spotted on the other side of the building, plus a smaller version spied along La Brea Avenue on August 12, 2015. 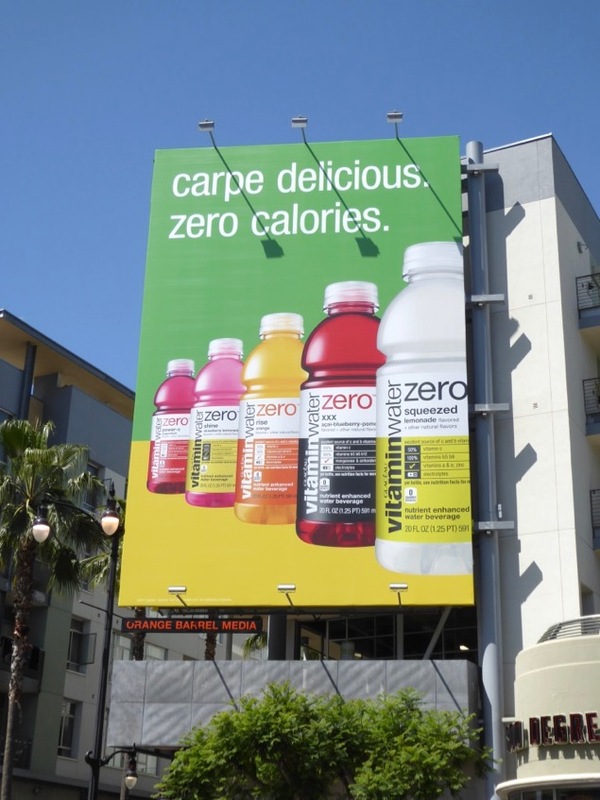 It's thirsty work photographing all these billboards in the hot Summer sun. 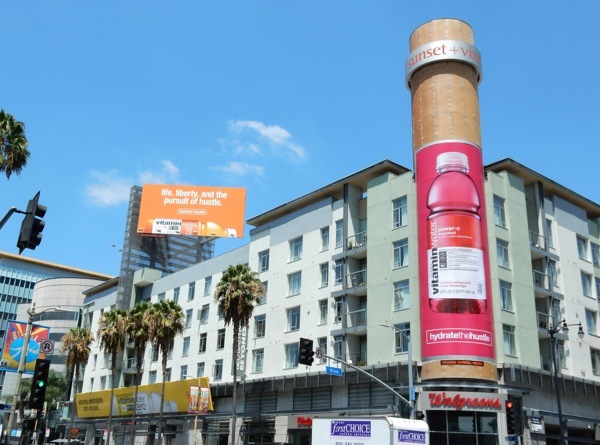 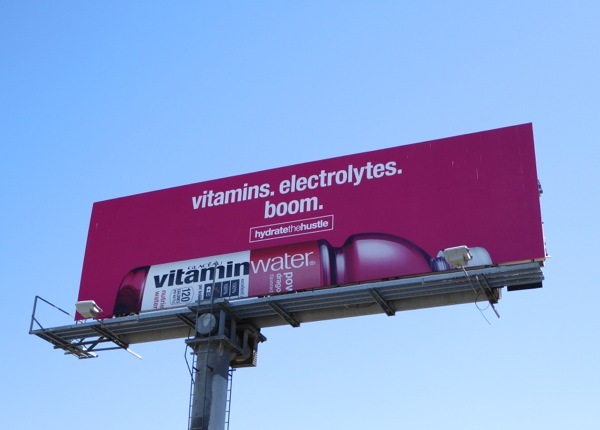 UPDATED: These Vitamin Water billboards really are taking over L.A.'s skies this month and here's a different 'Boom' creative spied along Highland Avenue on Aug 15, 2015. 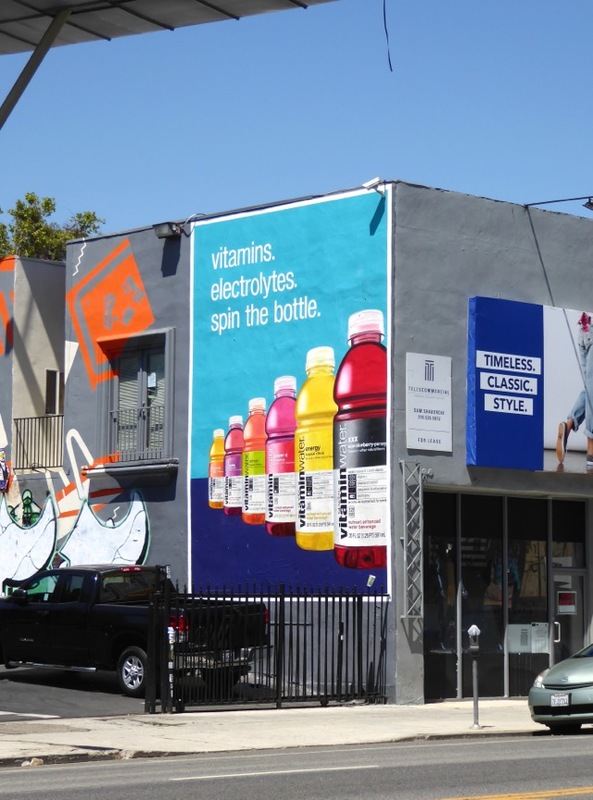 UPDATED: Almost a year later and Vitamin Water is progressing and refreshing their latest ad campaign by splitting their background colours in two. 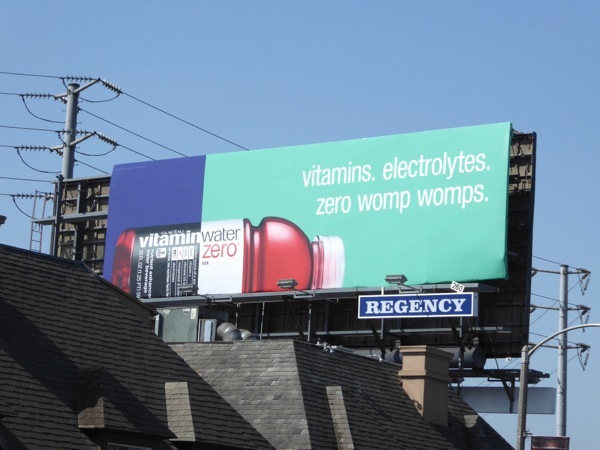 This 'zero womp womps' billboard was spotted along West Hollywood's Sunset Strip on June 16, 2016. 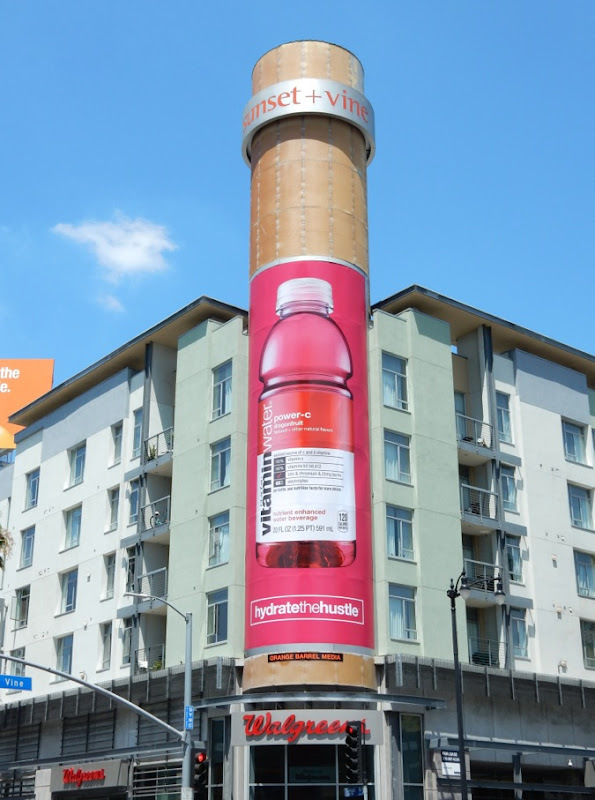 And here's another example from this new wave, featuring multiple bottles in a whole spectrum of colours, snapped along Melrose Avenue on July 14, 2016. 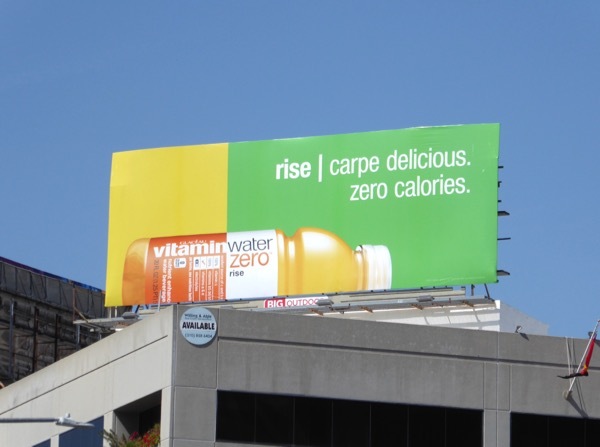 UPDATED: Here are two more examples of the new wave of Vitamin Water billboards with the split colour backgrounds. 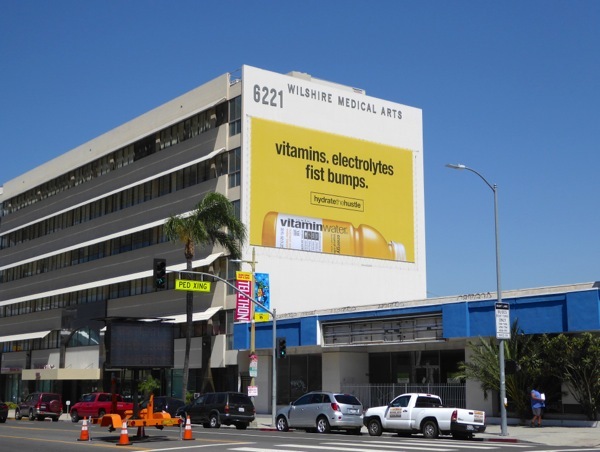 These large vertical billboards were snapped on the sides of the Eastown Apartments along Hollywood Boulevard on July 29, 2016. 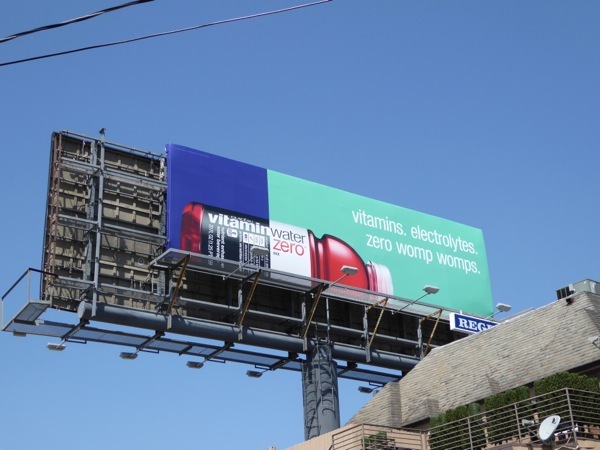 UPDATED: Vitamin Water is back in the skies for spring 2017, with this new 'carpe delicious' ad creative snapped high above San Vicente Boulevard on March 6, 2017. 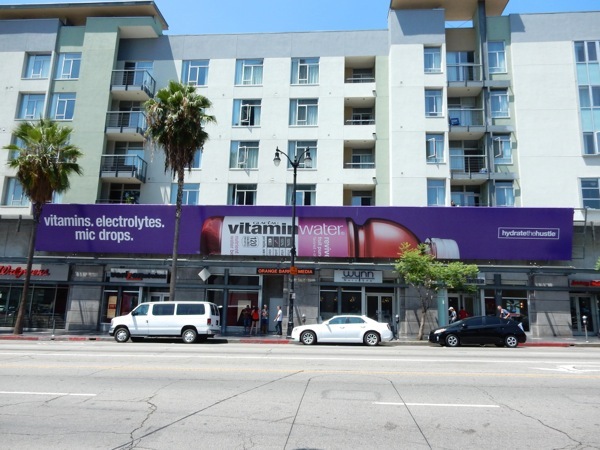 Plus with this larger multi-pack shot version along Hollywood's Vine Street around the same timing.